You can bet your bottom dollar that people from all walks of life would want to take advantage of a reputable online floral delivery service in all areas of Australia. What better way to make this happen than using a well known phone word such as 1300 FLORAL. This is pretty useful to any flower business, wouldn’t you agree? Now imagine, you are the owner of a florist who happen to have an array of floral arrangements at your disposal, ready to go to make someone’s special occasion even more memorable than it would have been without any flowers. Can you begin to see the wisdom in claiming a phone word as powerful as 1300 FLORAL? What can be smarter than having your brand name displayed in all shapes and sizes on various advertising mediums in the form of a phone number name like 1300 FLORAL? Said to be one of the easiest ways to create an awareness and make is easy for your customers to recall what your business is about, would be utilising phone words that says it all about your business. Best of all, it is super easy to set up, with no hidden costs and you can expect your business to prosper in ways you never thought possible. 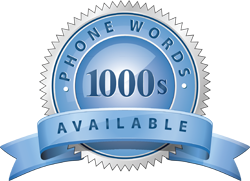 It is a known fact that through using 1300 phone words, you can achieve a much better response rate than what would have been possible if you only relied on your existing phone number. Recent studies revealed that Australian business owners experienced a whopping 300 percent increase in phone calls after using 1300 phone number names. The list goes on and on with regards to how you can make your floral business outstanding. Do not delay in making 1300 FLORAL your own and boost your profits like never before. Going with a phone word company like 1300 Easydial is one of the best decisions you can ever make. Doing so will provide you with the opportunity to truly stand out as different from other flower shops in your area. It will give you the edge over your competitors and improve brand awareness while it will promote your business, products and services to your target market. Make a difference right now and call 1300 Easydial to set up an appointment.